Bhubaneswar: The much awaited Konark International Cyclothon team, announced date of 3rd Konark International Cyclothon. 3rd Konark International Cyclothon will start from 23rd December, 2017 and will conclude at Koraput on 29th. This year theme of the Konark International Cyclothon is “Pedal to Preserve nature”. This was announced by KIC and ROOTS of Odisha Foundation , Founder and Director Sudhir Dash. Mr Dash said Konark International Cyclothon will start from 23rd December, 2017 with unique Moto and an enlarged perspective. Come 23rd December, 2017 and the chilled winter, over 1,000 of cyclist will parade on the Maring Drive from Konark to Satapada. Out of which 20 cyclist mentored by 5 NGOs will go on the 6 days cycling expedition from Konark to Koraput. 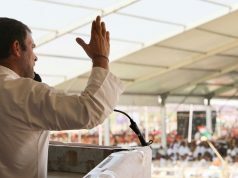 Srikhetra to Sabara Khetra. This visit via Chillika, Rambha, Chandragiri and the sabara khetra of Koraput is a mesmirising treat to our participant says an excited Sudhir Dash. 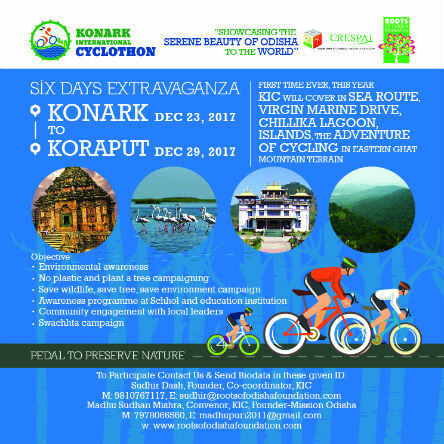 “ROOTS OF ODISHA FOUNDATION in association with CRESPAI (Confederation of Renewable Energy Service Providers And Industries) will host the 3rd Edition of Konark International Cyclothon with the mega support from various participating NGOs such as Mission Odisha, SELAR Society for ethical Legal Action and Reforms), Prerna etc,” said Mr. Dash . The Participating NGOs and their sponsored participant will create environmental awareness and promote social causes on the theme KIC is associated with. – Beach cleaning at Satapada. – Community engagement with local leaders. – Conclusion ceremony, Certificate distribution, felicitation at Koraput. While most cities in India fight Pollution and are worst affected due to Climate Change, Odisha has its unique demographic beauty. We should count our blessings and preserve our nature. This year KIC will cover the Coastal Line and the beautiful green mountain terrain of the eastern ghat showcasing the serene beauty of Odisha to the world narrates Shri Sudhir Dash.